With an astonishing surge of minority parties, the European election results have put at risk the three-decade-long supremacy of the ruling Popular Party (PP) and the Socialist Party (PSOE), today’s main opposition, creating the possibility of a hung parliament in the next national polls. Just three weeks after the EU vote, King Juan Carlos of Spain, 76, announced his abdication after reigning for nearly 40 years. This spurred a debate over the future role of the royal family. His youngest son, Crown Prince Felipe, 46, has recently taken over the throne. Since the democratic transition in the late 1970s, Spaniards have not been through so many political shake-ups in such a brief period of time. It marked a powerful turning point that has even overshadowed the recent progress in employment, still the biggest worry for the people and the major priority for the government. The PP and the PSOE’s joint share plummeted to less than 50 percent for the first time in decades in this year’s European elections. Although the ruling party currently holds an absolute majority in Parliament and an overwhelming dominance over Spanish institutions, the government’s conservative policies and its approach to institutional crisis have eroded its popular support. Meanwhile, the socialists have been incapable of capitalizing on widespread popular discontent. Polls provided a slap, albeit not too audible, in the faces of the traditional parties. The opposition that untiringly but ineffectively tries to attract more disappointed voters consist of the far-left party United Left and the centre-right UPyD –the fourth and the fifth parties in the Parliament. Support for these two parties totalled 16.5 percent of the votes, seven percentage points less than the PSOE. However, a party created in March, three months before the European elections, burst onto the political arena, gathering 1.2 million votes and becoming the fourth most voted political force in Spain. Podemos (We Can) targeted a glaring political gap comprised by around 2 million people who are highly exasperated with the political establishment and were willing to go to vote for a new, fresh voice. Its communication strategy notably contrasted to that of the PP and the PSOE, with a strong presence on the social networks, compensating for its absence in the mainstream media. Podemos echoed some of the proposals of Greece’s SYRIZA and the way Italy’s Five Star Movement refers to the traditional parties, describing them as “old political class.” Its leader, Pablo Iglesias, a professor of political science and philosophy, put forward an ardent defence of another way of doing politics in several TV talk shows. The other minority parties but also the PP and the PSOE have been stunned by the popular support for Podemos, whose members range from activists and lawyers to students and unemployed people. Media reports linked its leaders to the late Hugo Chavez’s party in Venezuelan, indicating that they had advised the former president and its cabinet during the past decade. As a response to their worst electoral result in history at the European’s, the socialists immediately launched a renovation campaign that is actually fuelling its internal fights and putting in doubt its readiness to confront the PP in the 2015 regional and 2016 general elections. Consequently, PSOE’s secretary general, Alfredo Pérez Rubalcaba, resigned after 40 years in politics and having been in charge of several ministries in up to three different socialist governments. Having contemplated their result in the European elections, all parties –whether they won or lost– unanimously concluded that now it’s a matter of renewing or dying. Spaniards were still trying to recover from a state of bewilderment after witnessing how the two parties that have ruled the country since 1982 had been pushed to the edge. A strained atmosphere followed but it had not climaxed until the King surprisingly abdicated, ending a 39-year-long reign. Corruption scandals, increasing health problems and an out-of-place patrician demeanour created a cocktail of inconveniences that was hard for Spaniards to digest in harsh times. This brought about an abrupt and unprecedented decline in King Juan Carlos’s popularity. Appealing for a change, the Spanish King attempted to reply to those critics that had hinted he resisted abdicating before. Some said it was not the best moment to step aside given that the European elections had been recently held and that the country had not emerged from the economic crisis. Consequently, it stirred a well-known debate in the streets and the political forums about whether to hold a referendum. The question of preserving today’s system of parliamentary monarchy or moving to a republic opened again a breach within the country. Political parties reaffirmed their support to Crown Prince Felipe –now King Felipe VI– and suggested that his accession was evidence of change in the Royal House; whilst, thousands of people marched in several Spanish cities calling for a referendum. In his first speech as King, Felipe VI, however, gave very few surprises. Without setting apart from his father’s institutional, extremely cautioned and plain oratory, the new Spanish monarch intermingled clear political messages to Catalonia –discouraging their independency aspirations– and the Basque Country, and to those who had been harshly hit by the crisis –youngsters, long-term unemployed, etc. However, as he insisted that he would work hard to make Spaniards feel proud of their king, called for “transparency” and “exemplariness”, and vowed to lead “a renewed monarchy for a new era”, Felipe VI fell short of condemning corruption scandals. Many hoped that King Felipe VI would have issued a more serious warning. Some of the newspapers that had underscored their monarchism in the recent weeks even cast veiled criticism on his speech. One of the new king’s sisters, Princess Cristina, is embroiled in a corruption scandal along with her husband, whose case has been a major embarrassment for the Royal House. Hinting that the new monarch would inherit her hot-button issue, Princess Cristina did not attend her brother’s proclamation and was previously excluded from the Royal Family membership. Indeed, just six days after Felipe VI was enthroned, she has been formally charged with money laundering and fiscal fraud. If she goes to trial and the appeal is rejected, she could face up to 16 years in jail. As a contrast, the King and his wife Letizia, a former TV anchor, exemplify a modern couple, with two daughters, and have long dodged any gentrified attitude. They have maintained their upward popularity when King Juan Carlos’ was dropping dramatically. Despite this, the new King and Queen will have to deal with a rising amount of sceptical people and push for renewal within their institution. Their reign will be crisis-scarred but they will surely count on the media compliance that, for example, has previously helped King Juan Carlos to avert some of his lovers and private trips being exposed. As for Spain’s politicians, the Royal House’s main threat will be a growing popular apathy. When it seemed that the economic crisis had moved closer to an end, its political hangover broke out as a consequence of successive corruption scandals, institutional mismanagement and a palpable disconnect between citizens and lawmakers that was exacerbated during the recent years. Reaching its zenith this month, the resulting institutional and political crises have engulfed the long-awaited and desired progress in unemployment –albeit still insufficient to signify a solid recovery. In May, the jobless rate dropped 2.3 percent, nearly 112,000 people, which has been the biggest fall recorded in that month since 1996. However, there are around 4.5 million people unemployed, putting the rate slightly above 25 percent and keeping it as the second highest in the eurozone. Why is the unemployment reduction road particularly rocky? The wide diversity of contracts and the labour flexibility are the two most cited reasons by the European Commission and the International Monetary Fund (IMF), but the major encumbrance might be the long-term jobless people. Around 60% of them have not worked for more than a year nor did 1.2 million workers over the last three years, the National Institute of Statistics (INE) stated in a bulletin published in May. Analysts have agreed that unemployment in Spain is stagnated in what has been called a “hysteresis process,” –which means that what has rapidly soared, will be difficult to decrease. International organizations such as the IMF have forecast that the unemployment rate will remain at levels close to 25 percent until 2016. In a report, the Bank of Spain said this month that it would descend very slowly in the following years despite a more rosy economic recovery. With growth expected to climb up to 1.2 percent this year from last year’s 1.2 percent contraction, the Spanish government’s and the European Commission’s eyes are focused on the fiscal policy. Six months after successfully exiting from the bail-out program, Madrid is focussed on recovering the popular support worn down during the years of austerity, while Brussels’s eyes are on maintaining discipline. 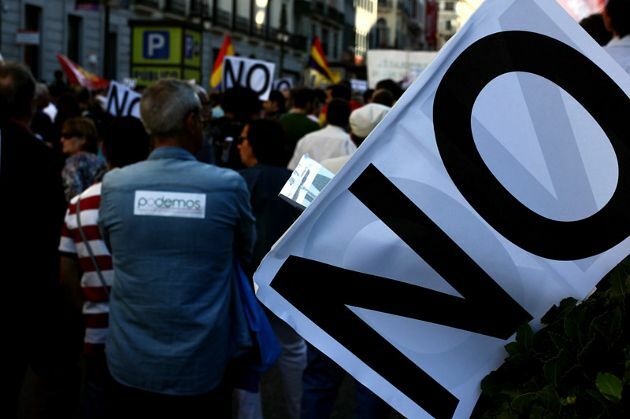 Spain’s government recently approved lessening income tax –whose rise, forced by the troika, triggered a popular backlash. However, Brussels responded by giving a wake-up-call to Mariano Rajoy’s cabinet, warning that, consequently, Spain would accomplish neither the deficit target nor the brokered fiscal consolidation. Yet, it seems there is not such a broad leeway to defer reforms: far from fulfilling deficit target of 5.8 percent this year and 4.2 percent in 2015, a ballooning public debt is getting closer to 100 percent of GDP. The needed adjustment has been estimated at nearly 13 billion euros. In this context, formulas to reinforce the incipient recovery are divergent. While the Bank of Spain demanded that the government should boost public expenditure, think-tanks and civil organizations have lambasted the banking sector, which is still restraining the credit flow to SMEs and households. Having suffered unrelenting attacks from financial markets during the euro crisis, investors have now blessed Spain as a safe haven. When a crisis of trust within Spaniards heightens towards its institutions and politicians, cliques of investors arrive every week in Spain to invest in its oversized real estate sector, in its hospitals, banks and strategic companies. It is astonishing how extremely calm the debt markets reacted to what seemed to be a strong rise of political risk in Spain,” Luis Garciano, a professor of the London School of Economic, highlighted. Spanish bond yields have dropped to a record low, trading with a lower yield than US bonds. The risk premium is stabilising at around 130 basis points, getting closer to the levels seen before the financial crisis. As several ministers have trumpeted, plunging borrowing costs as a glaring symptom of recovery, foreign funds have been relishing this renaissance atmosphere, acquiring fruitful bargains in the housing and banking sector. This author makes the same mistake as many in other countries: Take the vote for EU parliament as a _reliable_ forecast for next national elections. I understand your point Mr. Trickler but European elections' result -and specially the asthonishing surge of a newly created party- has no precedent in recent Spain's history. European elections could show voters' frustration but have ratified previous polls' trends in growing disaffection with the traditional parties and have reflected an unseen and unforecasted behaviour among voters. And that won't be just a voting-behaviour performed in the European elections. Experts and polls have agreed on that analysis and the two major parties are working and re-designing their strategies seriously taking into consideration the European elections' result.